The author of this work, James Willard Schultz, (1859 to 1947) was a noted author, explorer, Glacier National Park guide, fur trader and historian of the Blackfoot Indians. An Indian boy by adoption, J. W. Schultz has told his paleface brothers many good Indian tales. "Apauk, Caller of Buffalo", was a lad in the land and the days of the great buffalo herds. Apauk. a Blackfoot boy. was taught when young the art of calling buffalo. 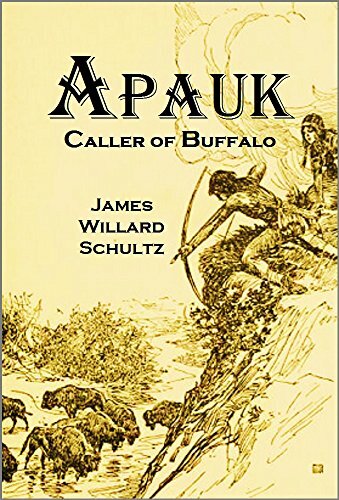 A new type of the wooly, wild west Indian story appears in "Apauk, Caller of Buffalo." More thrilling than Action, the life story of the greatest of the Blackfeet medicine men, not only possesses an enthralling interest but gives the reader an authoritative historical picture of the life of the American Indian on the great western plains before the invasion of the white man. The biographer, James Wlllard Schultz, is an adopted member of the Blackfeet tribe and has lived the life of an Indian for forty years. "ALTHOUGH I had known Apauk A—Flint Knife—for some time, it was not until the winter of 1879—80 that I became intimately acquainted with him. He was at that time the oldest member of the Piegan tribe of the Blackfeet Confederacy, and certainly looked it, for his once tall and powerful figure was shrunken and bent, and his skin had the appearance of wrinkled brown parchment. "In the fall of 1879, the late Joseph Kipp built a trading-post at the junction of the Judith River and Warm Spring Creek, near where the town of Lewistown, Montana, now stands, and as usual I passed the winter there with him. We had with us all the bands of the Piegans, and some of the bands of the Blood tribe, from Canada. The country was swarming with game, buffalo, elk, antelope, and deer, and the people hunted and were care-free and happy, as they had ever been up to that time. Camped beside our trading-post was old Hugh Monroe, or Rising Wolf, who had joined the Piegans in 1816, and it was through him that I came to know Apauk well enough to get the story of his remarkably adventurous and romantic youth. The two old men were great chums. Old as they were —Monroe was born in 1798, and Apauk was several years his senior—on pleasant days they mounted their horses and went hunting, and seldom failed to bring in game of some kind. And what a picturesque pair they were ! Both wore capotes ——hooded coats made from three-point Hudson Bay Company blankets—and leggins to match, and each carried an ancient Hudson Bay fuke, or flint-lock gun. They would have nothing to do with cap rifles, or the rim-fire cartridge, repeating weapons of modern make. Hundreds—yes, thousands of head of various game, many a savage grizzly, and a score or two of the enemy—— Sioux, Cree, Crow, Cheyenne, and Assiniboine, had they killed with the sputtering pieces, and they were their most cherished possessions. "Oh, that I could live over again those buffalo days! Those Winter evenings in Monroe’s or Apauk’s lodge, listening to their tales of the long ago! Nor was I the only interested listener: always there was a complete circle of guests around the cheerful fire; old men, to whom the tales brought memories of their own eventful days, and young men, who heard with intense interest of the adventures of their grandfathers, and of the “ calling of the buffalo,” which strange and wonderful method of obtaining at one swoop a whole tribe’s store of Winter food, they were never to witness. For the luring of whole herds of buffalo to their death had been Apauk’s sacred, honored, and danger-fraught avocation. He had been the most successful caller the confederacy of tribes had ever known, and so close to the gods was he believed to be that the people accorded him a position more honored than that of the greatest chief. As will be seen, the man himself had most implicit faith in his medicine; his dreams, the wanderings of his shadow while his body slept, were as real to him as was any act of his in broad daylight."